Maple Leaf Rag for Piano and French Horn, PDF file. Sheet Music for French Horn accompanied by Piano arranged by Lars Christian Lundholm. Interested in more amazing sheet music for Piano and French Horn when you are done shopping on this page? Or visit https://www.tradebit.com for more great offers on Piano and French Horn sheet music and backing tracks. All these and Maple Leaf Rag for Piano and French Horn are also available here and at https://www.tradebit.com as eBooks, epub files (perfect for iPads and tablet PC‘s). 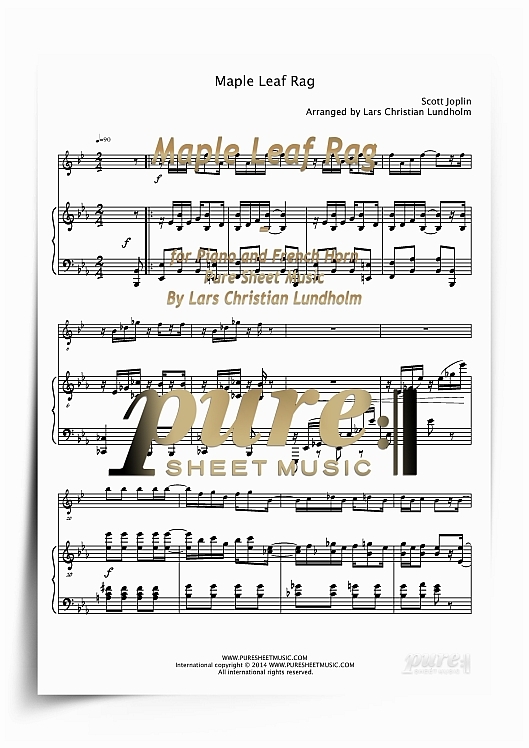 Simply search for "Maple Leaf Rag for Piano and French Horn (EPUB file), Pure Sheet Music as Ebook arranged by Lars Christian Lundholm" if you are looking for the eBook reader/iPad friendly version of this sheet music.